I am working 24 days straight this October. No break. I guess I did get October 16th and 17th off my Job, but I had two midterms and a paper to write in that time. After that, I was back to the Office. I love working. I do. My Job involves putting on a full face of stage make up and fancy tights and seasonal earrings before hitting the Office. I get to meet/talk to/entertain hundreds of people. It’s fun! It’s exhausting! I’ve almost mastered liquid eyeliner! Also, as you can imagine, my co-workers in the storytelling bizz are rad. My school friends are also rad. So are you, probably. Between the three, I have basically become socially active to a fault. Last night, when I hit the pub next door for a bite, the band knew me so well they let me pick their last set list. Then we watched the trailer for the new Diehard movie. Then I made very serious plans with a couple girlfriends to have a movie marathon to honour Mr. John Maclan next week. I also do my homework. I also sleep, sometimes. Basically, I’m busy. Not busy in an I-don’t-have-time-for-you way. It’s more of an I-don’t-have-time-for-me way (and a sorry-I-didnt-post-this-till-Saturday-morning way). I’m not complaining. I always get in my half hour of the Daily Show y Tetris before crashing into my unmade bed. But there’s this thing called “relaxation” that all the cool Zen kids are talking about, and admittedly I crave it every now and then. I crave the ability to just sit and listen to a great album, or to enjoy a beer, or to take a long shower. And no, I don’t have time to do all three one by one. I know this might look crazy to people who haven’t done it before, but trust me: if showers count for most or all of your downtime, you’re going to want to make the most of it. Lighting candles? Yeah, okay, I know it looks gimmick-y. But to me, it’s one invaluable way to make the bathroom a semi-spa for just a few beautiful, calm minutes. And, yes–having a beer in the shower, or any drink of choice, helps increase the feeling of “Okay. Okay. This is downtime. I’m not kidding, body. De-stress plz.” On nights when I don’t feel like a beer, I opt for Domingo pseudo-coolers. I’m not advocating drinking to excess in the shower (or in general, for that matter). Alcohol is not the point. 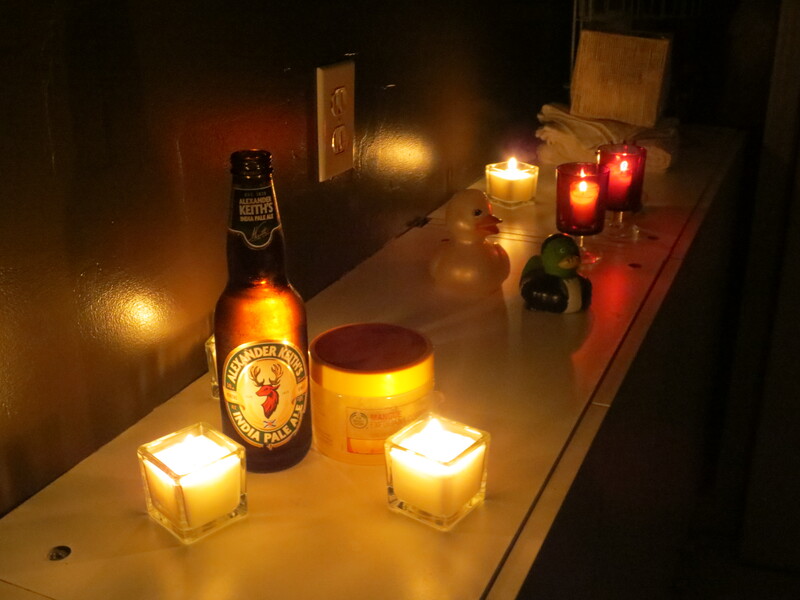 The point is that if you want to relax after work with a drink, bringing it into that candlelit shower is a great call. Yeah, INTO the shower. Take that, Jimmy Fallon. Also: exfoliate. Condition. Not just cuz it’s healthy, though that’s a bonus, but you guys: it’s relaxing. Paint your nails. Wash your face. BREATHE. Light a Roman Candle Fun. Out On the Town Fun. Admittedly, it’s a little overwhelmed by a couple bands, but the playlist changes with the seasons. And it’s chill. It’s calm. When the playlist meets some nice-smelling candles and a nice smelling exfoliate and a nice tasting beverage and a clear head, it makes for one hell of a break from the real world.